INDIANAPOLIS — One of Indiana's largest employers is recruiting to fill hundreds of open positions. 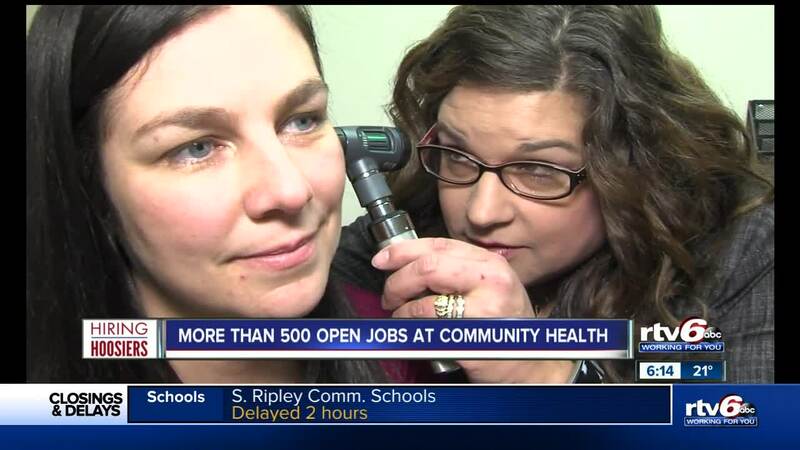 Community Health Network now employs more than 14,000 workers and is looking to hire 500 more people. Kayla Laster is a medical assistant for Community Health Network, assigned to handle the healthcare needs of other community workers. "I love the department that I'm currently in, but if someone wanted to switch, it's very easy to go up in the ranks," Laster said. "There's room for growth at Community." Laster has worked at Community for six years. She loves it for the family-like team atmosphere, benefits, and available wellness programs. The hospital network is working to fill positions ranging from specialized physicians and paramedics, to cooks and telephone operators. There is something for everyone, depending on your experience and schooling. Scott Sendelweck works in the human resources talent marketing department. He points out Communty is using a new tool to find and hire qualified candidates. Community Health Network is the first hospital organization in Indiana to use text-based recruiting. "While we will use those traditional methods to reach out to you, texting is very efficient," Sendelweck said. "It's very quick and we're getting a really solid response rate from those texts." Since the text-based recruiting model was installed at Community, positions have been filled faster, Sendelweck said. Community boasts its low turnover rate, saying it values the longevity of a career. The hospital network has properties across Indianapolis, which could help those applicants with transportation challenges too.